As a friend of Jonathan’s Voice – we invite you to talk openly and speak out about mental health and mental wellbeing amongst your family, friends and colleagues. As part of creating a more open environment and culture in the workplace, which removes “mental health as the last taboo” (Jonathan’s own words) we hope that others who may be facing mental health challenges find the courage to get support. 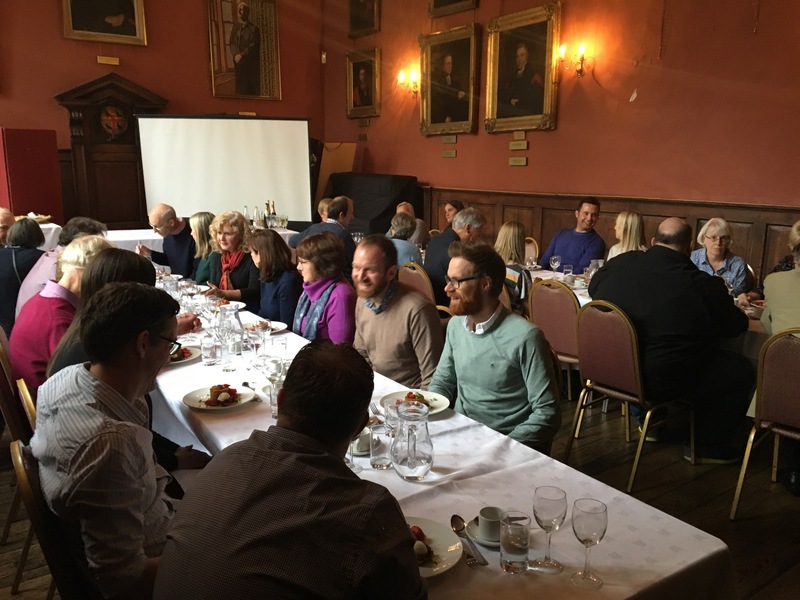 On a freezing last Saturday of October 2018 in Oxford, we were pleased to host our inaugural lunch for friends and supporters, in the splendid setting of the Old Dining Hall, St Edmund Hall. We are most grateful to St Edmund Hall for their generosity in providing such a superb meal and with such attentive staff, which was welcomed by all. The occasion was a wonderful opportunity for all of us to mix and get to know each other, and as we move forward with our Charitable activies will create a strong network. We presented an update on the progress and activities that have taken place over the past ten months, and highlighted some specific events we have been involved in to raise awareness of the importance of staying mentally healthy. It was also the opportunity, first hand, to recognise and acknowledge some amazing fund-raising efforts and inspiration for others (not all have to be feats requiring supreme physical fitness!). Very importantly, we were so pleased that we could report to everyone, that we are now a Registered Charity and a member of the National Suicide Prevention Alliance (NSPA). Many resources, such as leaflets, booklets, and our own (new) beautifully designed and printed Christmas Cards and posters were available to take away and well received by our supporters. We are especially grateful to the Card Factory Foundation who have produced these at no cost for us. If you would like to receive cards or posters, please get in touch with us by email. Plans for the coming months, include a continuation of our work with Nottingham Forest Community Trust, with IP Inclusive and with the Card Factory. The lunch however, also generated excellent discussion and idea generation amongst everyone, of future activities for reaching out to other sponsors and communities. We trust we will be able to grow and widen our scope of support for our very deeply felt, and unquestionably important message of our new Charity’s purpose. We hope to run another event for friends and supporters in the late spring and will be emailing out details in due course. If you would like to sign up to receive our newsletter and information about our work, please send an email to the above address and we will put you on our mailing list. Volunteers from Haseltine Lake get their hands dirty!